No, Fast Eddie is not the would-be Cassanova of your high school class. He is an energetic fellow whose main objective in life is running around what seems to be an unfinished four-story building grabbing various prizes that float by. Your objective is to guide Eddie up and down the connecting ladders as well as horizontally over each floor to enable him to get each prize. Also inhabiting the building are several Sneakers (yes, Sneakers) that actually look more like tap-dancing cockroaches. Unfortunately, somewhere along the line Eddie has made enemies of these Sneakers and they are all out to trip him (Eddie seems to melt more than actually to trip on a Sneaker). When Eddie trips he falls to his death and a new Eddie takes his place (apparently somewhere there is a Master Eddie who is being cloned). You start each game with three extra Eddies and are awarded one replacement Eddie each time you successfully complete a play screen. However, you will never have more than three spare Eddies. The number of spare Eddies is indicated by short lines under your score at the top of the screen. So then, the object of the game is to avoid the Sneakers by running away from them to another floor or by jumping over them. At the beginning of the lowest level of play, some of the Sneakers are running back and forth (always in a consistent speed and pattern), and some are standing still. Obviously the stationary Sneakers are easy to avoid, although my Eddie was at first very prone to bump into them anyway. The moving Sneakers at the lower skill levels are also fairly easy to avoid, especially if you can teach Eddie to take a running start before trying to hurdle them. Jumping from a dead stop results in a vertical jump, which is useful for jumping up to grab the prizes (besides being clumsy, Eddie is also short). However, the most useful jump is that which is preceded by a run so that it has both height and breadth. If Eddie touches a Sneaker, he trips, so it is imperative that he become skilled at completely clearing his obstacles. To this end, it is easiest to approach an oncoming Sneaker at a run and jump over it right before it collides with Eddie. It is much easier to jump too late than too soon. Eddie will be slightly less likely to land on top of the Sneaker and fall than to trip during his take-off. Therefore, during the early stages of the game, when jumping over just one Sneaker at a time, start the jump a little early to be on the safe side. Jumping over a Sneaker that is going in the same direction as Eddie is obviously counter-productive. At the top of the building is a long-legged Sneaker (High-top) that is too tall for Eddie to jump. After the ninth prize is pocketed, High-top shrinks to a more manageable size and holds a key over its head (its laces?). Eddie must now jump over High-top and get the key. There is still one more prize left, which may be taken for an extra 90 points, but it is not worth the extra points if, in the process of trying to secure the prize, you lose Eddie. The joystick moves Eddie horizontally across each floor of the building, and vertically up the connecting ladders. Pressing the red button on the controller enables Eddie to jump. The red button also resets the game after your last Eddie has fallen to his death. Pressing the Color-BW lever on the console freezes the game, allowing you to go to fix a snack or let the dog out. The trick is get your hand off of the joystick and onto the Color-BW switch before your immobile Eddie is tripped by a speeding Sneaker. There are ten prizes for Eddie to grab per play screen. He must grab nine in order to go on to the next screen. The first prize grabbed is worth 10 points, with each successive prize being worth 10 points more than the last until nine are grabbed. The ninth prize is worth 90 points, as is the tenth prize, which is optional. Scoring always starts over at 10 for the first prize on each play screen. The beginner level of play has two roving Sneakers and two stationary ones. The strategy, therefore, is to use the floors on which the lazy Sneakers dwell as a base of operations, only going onto the other floors to grab a prize quickly and retreat. Be careful that Eddie doesn't trip over the stationary Sneakers--he must still take a running jump over them. There are always two prizes on the screen; one moves across the floors at a slower pace than the Sneakers and Eddie, and one stays still. When a prize is grabbed, the number of points awarded is shown briefly in place of the prize, and then a new prize appears in a different location. The new prize will never appear on the same floor as Eddie. Eddie is very unlikely to be tripped while climbing or descending a ladder. This fact is particularly useful when the ladders are arranged one on top of the other, so that Eddie can climb through several floors without getting off the connected ladders. Since one of the two prizes on the screen is moving, theoretically at least, if Eddie can keep moving up and down the ladder without stopping or inadvertently getting off, the prize will eventually cross his path. Unfortunately, it is difficult to keep Eddie moving back and forth without a pause. It is generally easier to tackle the prize by jumping over the Sneakers, thereby letting it get to the opposite end of the floor. The single most important move to master is that of making a vertical jump at the edge of the screen just as the approaching Sneaker is about to get Eddie. The Sneaker will either reverse direction and move harmlessly away, or pass under him and move off stage. This move is often the only way to avoid the bigger Sneakers or groups. There also seems to be more leeway in the timing of this maneuver, with Eddie staying airborne longer. 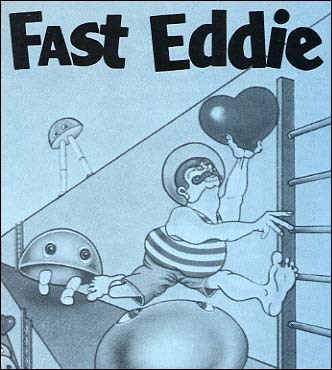 Each of the eight games of Fast Eddie is simply the basic game, but starting at a different skill level. Therefore, if you can stay in Game 1 long enough, you will eventually pass through Game 8. This is great for practicing at the higher levels without having to go through all the beginning stages. Game 1: Beginning level. Each floor has single Sneakers, which, after the first screen, all move until an Eddie is lost, at which time, two of them stop. Game 2: The first three floors have single Sneakers, and the top floor has twin Sneakers, close together. All of the Sneakers move, and do not stop after an Eddie has been tripped. The twin Sneakers are so close together that jumping over them is no problem. Game 3: There is a single Sneaker on the bottom floor and three widely spaced ones on the second and fourth floors. These fellows are so widely spaced that only two fit on the screen at a time, with the third reappearing from off stage as they move back and forth. You must keep track of which side it left from, so that you know where to expect it next. These Sneakers are impossible to jump over in the regular manner, since as you clear one you land on top of the next. Therefore, the following method must be used to remain on their floor for more than a few seconds (when grabbing a prize, for instance). 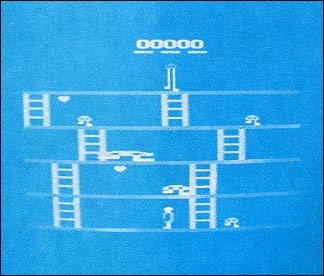 As soon as the game starts, go to the ladder on the right and wait until the Sneaker on the left side leaves the screen. At this time, go to their floor and move all the way to the right edge. As the Sneakers come back to you, make a vertical jump (not running) over the first one (the one on the right end), it will pass under you and leave the screen. Wait about a second and jump over the next one; it will safely reverse direction under you. Now wait the same amount of time and jump again; the Sneaker which was off stage will reappear under your feet (if your timing was right) and move off to the right. If you want to move to the next level, this is your chance. If there is a prize to be won on this level, simply wait at the far right of the screen and repeat the procedure as many times as is necessary for the prize to coincide with your jumps over the sneakers. You won't have to wait long. In this game, the third level has a big Sneaker, which is not too hard to jump over, especially if you have mastered the technique of leaving the ground at the last possible moment to clear the bigger obstacle. Game 4: The first floor has a single Sneaker, and the second floor has two Sneakers with a moderate distance between them. Eddie can jump over them with practice. The third floor has the two little twin Sneakers, close together--no problem--and the fourth floor has the three obnoxious Sneakers, wide apart. Use the method described above to make just one entrance onto this floor. Forget about the optional prize for a while. Game 5: The first floor has a single Sneaker, and the second has one bigger one. The third floor has a gigantic Sneaker, which Eddie can jump over, but only if he concentrates! The third floor again has the three widely spaced Sneakers. Game 6: The first floor has a single Sneaker, and the second has triplets whose total size is about the same as the gigantic Sneaker; it is possible to jump them, but avoidance is probably the best route. The third floor has the single big Sneaker and the fourth has the three widely spaced ones. Game 7: The first floor has a single Sneaker, and the second has the two moderately spaced ones. On the third floor is the big Sneaker. The fourth floor has a nasty combination of three moderately spaced Sneakers, and then at the other end, two moderately spaced ones. Needless to say, they do not all fit on the screen, so you must contend with their sudden appearance at the edge of the floor. Also, they cannot be jumped in the conventional manner. You must approach the floor from the left ladder, and get between the two sets (see the diagram: there are two more Sneakers in this group, but both are off stage--one on each side of the screen) as they are moving to the left. Move with them to the far left of the screen, and make a vertical jump just as the Sneaker A is about to get Eddie. It will reverse direction and Eddie will be safe. At this point, he will be surrounded and will have to move back and forth as they do until the time is right to make his escape to the top floor to get the key. Obviously, it is best to forget the optional prize on this floor; it will take all of your concentration just to keep Eddie alive. Game 8: The first floor has the one big Sneaker, the second has the two moderately spaced ones, and the third has three close Sneakers. The fourth floor has the same miserable combination of three and two described in Game 7. Use the same strategy.